Your child’s birthday party is one of the most important events in their lives. It is the topic of conversation in the playground. The run-up and excitement to their birthday is all-consuming. For you however, it may be daunting. The thought of 30 five year olds in a room for 2 hours may not be something you are particularly looking forward to, but your child is insisting on it as they see all their friends having parties and they don’t want to feel left out. The solution: hire a birthday party magician. What are you getting from me? I am here to help you with your child’s birthday party. You and your child will benefit from my 20 years’ experience. 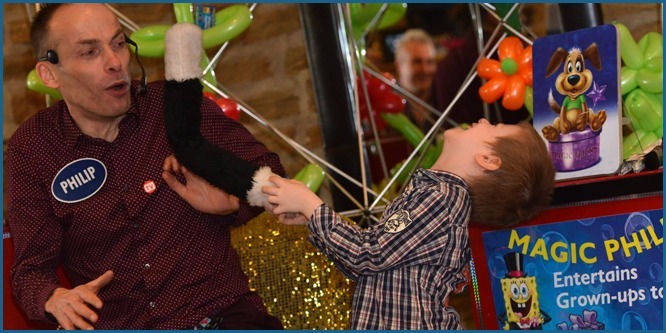 I know how to bring out the best in everyone, kids and grown-ups alike, ensuring that everyone will leave your party entertained and having had the time of their lives. Your child’s party will be the talk of the playground for weeks after the event. How do I know this? Because I get invited back year after year by my bookers and they tell me. If you are hosting your child’s birthday party in Manchester, Greater Manchester, Hale, Bowdon, or Didsbury, I am the right choice for you. Choose the birthday entertainment that best suits your needs and your unique requirements: From 50 minutes of amazement and hilarity where every child, every family member and every grown up sits transfixed to 2 hours of non-stop action and enjoyment where the walls of the room rock with howls of laughter and fun. Your child will have the party of their dreams and you will have a wonderfully enjoyable and relaxing day watching your child being the star of their special birthday celebration, guaranteed. With the 50 minute Birthday party Magician show your child and their friends get to experience an hilarious, jaw-dropping and totally engaging birthday show brimming with comedy, puppets, stories and of course MAGIC! Everyone – grown-ups included – will be glued to the spot, not wanting to miss a beat, ensuring that your party runs smoothly. Best of all, your child is the star! Your child will get to do a special Birthday Magic Trick only the birthday star can do. But since birthday parties are a family affair, I also strive to include siblings if they want to help. 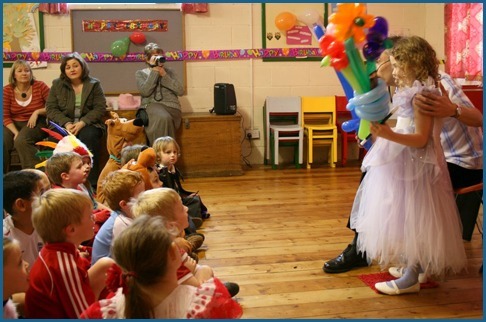 The 2 hour stress free birthday party magic and games show ensures your child and their friends are engaged and entertained from the moment they arrive at your party to the moment they say goodbye. This option provides you a complete end-to-end birthday party solution, leaving you free to join in the fun and be part of your child’s memories from their party. During the 2 hour stress-free birthday party show I crank up the fun-o-meter with a Happy Birthday sing-along, non-elimination party games with music and dancing, and a special trick for your birthday child. I host the party for the full 2 hours so you don’t have to worry about anything. Have you ever considered having your child’s birthday party in the week? Weekday parties have become very popular. They always have a good turnout because the children can attend straight from school (even potentially in your child’s school hall). It also frees up your weekend so that you can have a smaller family celebration. This also means your child and their friends won’t miss out on any regular clubs they attend. 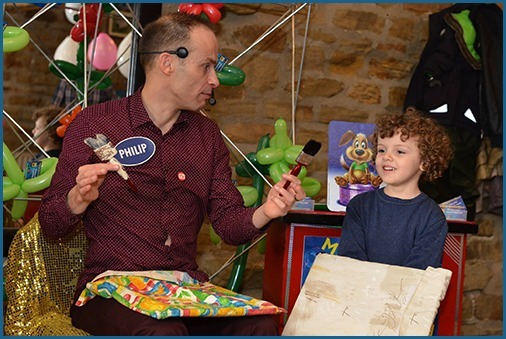 My experience as a birthday party magician has been that those parents who opt for a weekday slot one year very rarely return to weekend parties in future years.